The restaurant has a breezy open-plan design. 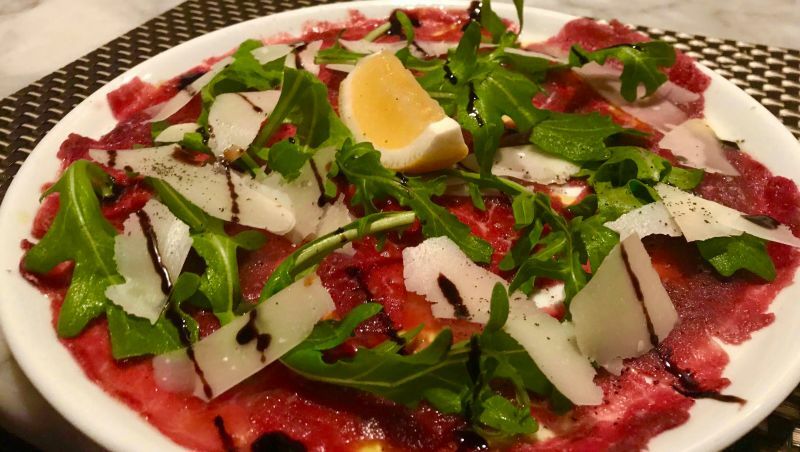 Starting light with beef carpaccio. The yellowfin tuna steak is not to be missed. Savoury rhubarb merged with a light sponge cake, Patrik’s family recipe. The striking checkerboard floor and varied artwork from around the world give the restaurant a certain trendy edge. 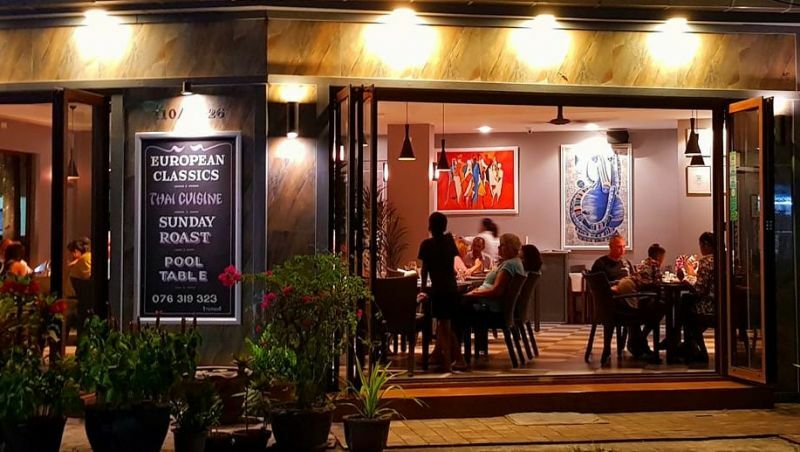 The Kathu brasserie is located on Bangthong Rd and offers a surprisingly peaceful respite from the busy main road just a stone’s throw away. 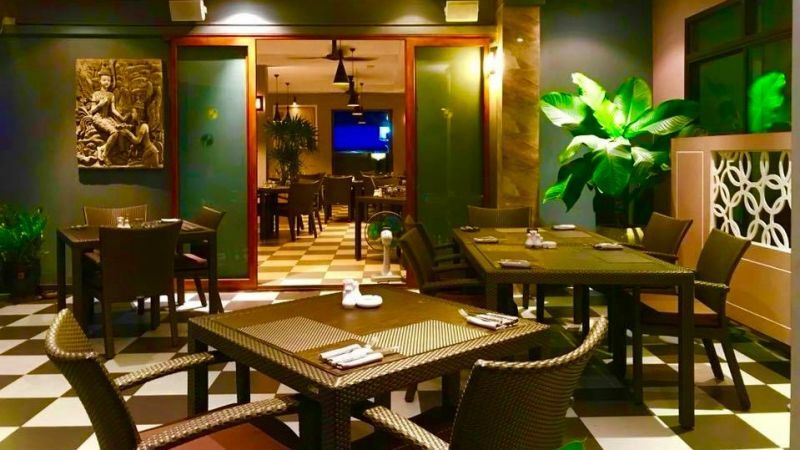 A hit with locals, expats and tourists alike, the fine dining eatery is rated the number one restaurant in Phuket on TripAdvisor out of a staggering 2,975 on the island. Despite being so highly regarded, there is no sense of pretension. The restaurant’s breezy open-plan design means their doors are, quite literally, always open. 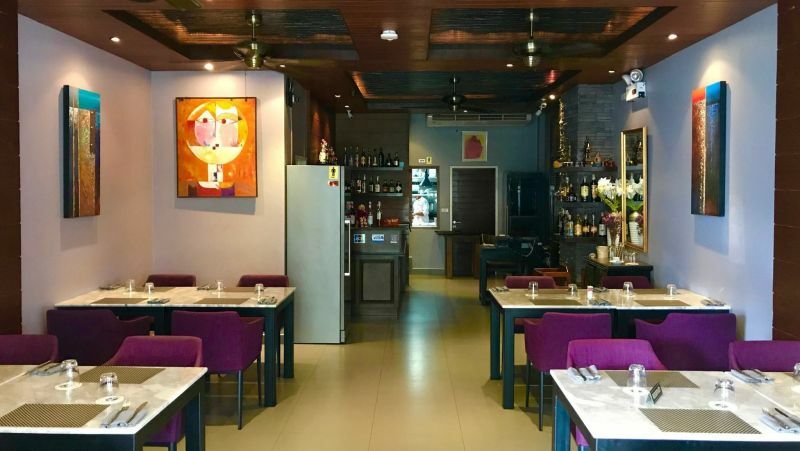 The warm violet interiors make for a relaxed ambience while the striking checkerboard floor and varied artwork from around the world give the restaurant a certain trendy edge. It’s clear to see why some customers choose to celebrate birthdays, weddings and other special occasions here. Staff and General Manager Patrik Lundgren are extremely friendly and attentive throughout the dining experi­ence without being intrusive or disin­genuous. Patrik and his wife, Executive Chef Phonchan, opened Thong Dee eight years ago with the aim of offering high-quality European and Thai food. In their experience, when restaurants offer both, one cuisine is excellent but the other suffers. However, they felt able to buck this trend given their back­grounds: Patrik was born in Chile but raised in Sweden and Phonchan was born and raised in Thailand. As a re­sult, the menu is varied. They do a lot, yes, but they do it all very well. First to the table is a Spanish favourite: gambas pil pil. The dish – prawns nestled in a mini Le Creuset-style pot, sautéed in chili, garlic, olive oil and oregano and topped with parsley – is succulent and customers will be grateful for the accompanying bread to soak up what’s left of the juices. Beef carpaccio follows shortly after. The thinly-sliced Australian beef, driz­zled in truffle oil and sprinkled with sheets of Parmesan, sits under a rucola salad of tangy rocket, tomatoes, lemon and black pepper. It’s a lighter dish that should leave room for vegetarian spring rolls with aromatic sweet chili and plum sauce. After a small palate cleanser of mango sorbet, it’s time for the main event: duck Pad Ka Prao Ped. The meat is usually minced in this traditional Thai dish but the chef’s decision to serve it sliced is a welcome change. Chi­li, fried Thai basil, green peppercorn and white rice are the natural accompa­niments here. As with many dishes on offer, customers can choose a different meat – in this case chicken fillet – as well as their preferred spice levels for a tailor-made dish. 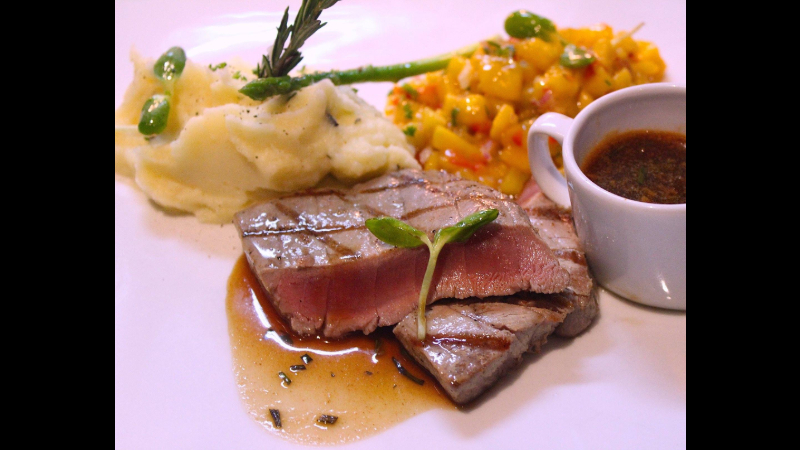 However, it’s the yellowfin tuna, grilled medium-rare, and served with diced mango, paprika salsa, mashed potato and rosemary jus that steals the show. The fillet is tender and the con­trast of the sweet mango and punchy salsa is a fantastic accompaniment to it. Patrik is on hand to recommend bev­erage pairings from a comprehensive worldwide list. 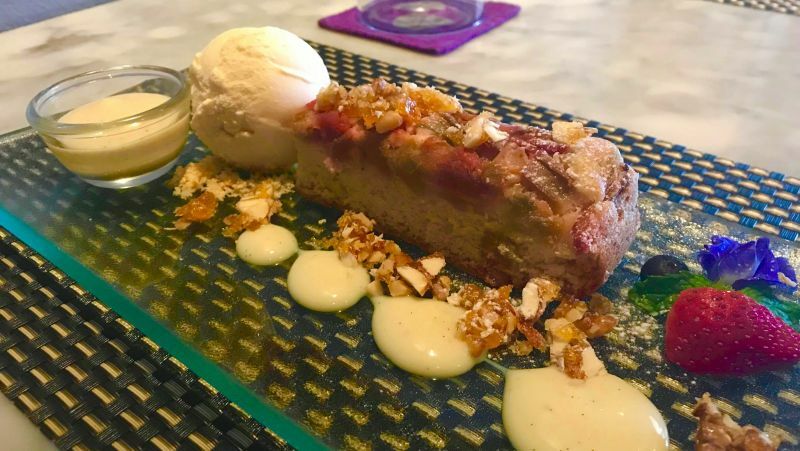 Lastly, dessert is served: savoury rhubarb merged with a light sponge cake, topped with an almond crunch and served with vanilla sauce. The des­sert is a family recipe of Patrik’s. The rhubarb is imported from France on ac­count of its superior taste to the bitter, Thai offering. If you’re looking for some­thing richer, the warm, dark chocolate lava cake with a melted centre might just hit the spot. Thong Dee have experimented with different chefs over the years – some offering molecular gastronomy, others pub food – but it’s clear that they have found their happy medium now that the kitchen is run by Phonchan and her family. As Patrik says, it’s all done with heart. Thong Dee is located at Bangthong Rd, 110/25, Kathu, 83110. Open Tuesday to Saturday from 4pm to 10pm, Sunday 12pm to 10pm. Closed Monday.